After a volatile session in North America, the major equity indices closed higher. In fact, the 1.75% rise in the S&P 500 was the best since November 2016. Asian equities stabilized, and the MSCI Asia Pacific Index was able to eke out a small gain. The European markets are moving higher is also posting early gains and the Dow Jones Stoxx 600 is about 0.45%, which threatens to snap the seven-day slide. However, the main challenge now is that the S&P 500 are trading nearly 1% lower. There were two main exceptions to the equity recovery in Asia: China and Korea. Chinese markets opened higher, but the Shanghai Composite finished off 1.8% lower, with banks, insurers, and property developers leading the way. An index of Shanghai's 50 largest stocks closed nearly 3% lower, while a small cap index gained 1.1%. In Korea, foreign investors were net sellers like on Tuesday (sold KRW226 bln today after selling KRW280 bln yesterday), but the big difference was domestic investors. They were net buyers of near KRW108 bln on Tuesday but sold KRW529 bln today. The stabilization of equities is not weighing on bond yields today. In fact, the US 10-year yield is has been turned back after rebounding to 2.80% yesterday. It is off four basis points in the European morning. Investors are returning to the periphery of Europe where Spanish and Italian 10-year benchmark yields are off four-five basis points, while Portugal's leading the way with a nearly nine basis point decline. Before the equity market disruption, we had thought that pendulum of market psychology swung too far against the dollar. Sentiment and positioning seemed extreme. We also did not think market participants were giving sufficient due to the US fundamentals, and in particular, the widening interest rate differential and the favorable policy mix of fiscal stimulus and tighter monetary policy. Yesterday, before the S&P 500 found a base, the euro approached its 20-day moving average (~$1.2300) that had offered support since the end of last year, and in so doing penetrated last week's lows (~$1.2335) intraday. The euro is firmer today, but the technical indicators have turned (e.g. MACDs and Slow Stochastics), and we expect offers to re-emerge in the $1.2400-$1.2440 area. German industrial output softened in December (-0.6%), but yesterday's strong factory orders and the recent PMI suggest this is noise and likely a response to the outsized 3.1% (initially 3.4%) gain in November. Meanwhile, efforts to forge a new coalition after last September's election overcame the immediate obstacle and the distribution of ministries between the CDU/CSU and the SPD have reportedly been agreed. The euro's failure to respond positively suggest that 1) it has been accepted, that despite overrunning self-imposed deadlines, that a deal was going to materialize, and 2) the powerful uptrend seen from mid-December to late January has been broken. The dollar dropped to nearly JPY108.45 yesterday during the equity drop but held above last week's low (~JPY108.30), putting in a potential double bottom. It traded as high as JPY109.70 in Asia, before coming back off, perhaps pulled by the easing of global yields. The technical indicators are constructive, and a move above JPY110.50 is needed to confirm the low. The 20-day moving average has kept upticks in check for the past month. It is found just below JPY110 now. Options expiring today struck at JPY109.40-JPY109.50 for around $820 mln may offer an additional barrier today. Sterling has underperformed in recent days. All three January PMI readings disappointed expectations. The jockeying for position within in the Tory Party favors those forces seeking a starker break from the EU, and a hard Brexit has tended to weigh on the pound. The euro has bounced from near GBP0.8700 on February 1 to briefly push through GBP0.8900 yesterday. The euro has not been above GBP0.8930 since late November. Sterling's losses against the dollar brought it to nearly the 61.8% retracement (~$1.3800) of the last leg up that began on January 11 near $1.3460. The $1.4000-$1.4050 area should contain upticks The technical indicators have turned lower. The Australian dollar appeared to be working on retracing a larger move than sterling. With yesterday's losses, the Aussie had retraced nearly 50% (~$0.7820) of the advance that began in early December from around $0.7500, which also coincides with congestion and other chart support. The 61.8% retracement is closer to $0.7745. The $0.7900 area capped the upticks in Asia. The US dollar approached the upper end of the year's range against the Canadian dollar yesterday near CAD1.2585. The greenback reversed and settled on session lows. Initial support is seen near CAD1.2480. The technical indicators favor a further recovery in the US dollar. A move above CAD1.2600 will likely spark another bout of position adjusting. The market may have gotten slightly ahead of itself in downgrading the likelihood of a March Fed hike because of the recent volatility in the stock market. Equity prices seemed stretched, and more than one Fed official has commented on it. Officials may have preferred a more stable adjustment, but they are unlikely to protest the direction. And that direction, at the end of the day, was not so large as the media's emphasis on the point moves instead of percentages. That is to say, the impact on sentiment and spending and investing behavior is likely to be minimal and short-lived. According to Bloomberg's calculation, the priced in a 99% chance of a hike into the March Fed funds futures contract at the end of January. Following the employment data and the first leg down in equities, there was still nearly a 93% chance still priced in at the end of last week. That fell to about 80% yesterday before firming back toward 87% into the close as equities melted up. The US House of Representatives passed another continuing resolution to prevent a government shutdown starting Friday. It extends spending authority through March 23, while boosting defense spending for the remainder of the fiscal year. But, do not let it distract from the larger effort in the Senate. A deal may be in the works that resolves the spending authorization and the debt ceiling issues. Essentially, rather than split the differences and compromise, the solution is to let both sides have what they want. 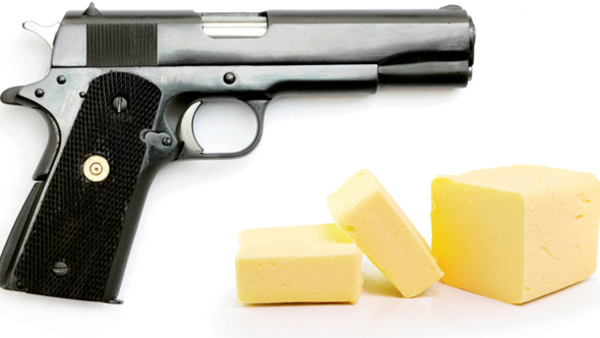 Guns and butter. Military and non-defense spending caps imposed by a 2011 agreement will be lifted this year and next. When coupled with the recently approved tax cuts, it is difficult not to see how the fiscal condition will deteriorate. Making it even more troublesome is that it comes at a time when the US economy is already growing above trend, and we continue to point out the accumulation of evidence that it is in a mature or late part of the business cycle. The debt hangover from a regime of tax cuts and spending increases may shape the investment climate in the futures as well as be a key issue in the 2020 elections.